It seems there are two extremes when it comes to meal planning. There are people who never plan – the ones who prefer to “wait and see” what they feel like eating. They’re also the ones who, understandably, don’t have much discipline when it comes to sticking to a diet plan. On the other hand, there are those whose meal planning is just a tad too routine. Some people tend to stick to the same menu week after week – Monday chicken, Tuesday spaghetti… you get the idea. Somewhere in between these extremes, though, lies a healthy approach to meal planning that doesn’t have to be stressful or time-consuming. 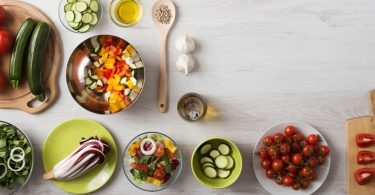 So if your idea of meal planning means choosing between sausages or pepperoni on your pizza, listen up – here are some pointers that might help. • Keep a stash of quick, healthy recipes you can turn to. Simple and nutritious recipes are easy to find in cookbooks, magazines and on the web, and when you’ve got a couple dozen to pick from, you can rotate them over a few weeks and your dinners won’t become too routine. Always have healthy staples on hand. Keep veggies, fruits and seafood in the freezer and keep your pantry stocked with staples like whole grains, canned beans, tuna and tomatoes, chicken or vegetable broth, spices and herbs. With these items on hand, you’ve got the start of a healthy soup, curry or pasta dish that you can throw together in no time. Look for convenient shortcuts you can use. Frozen veggies can be substituted for fresh, and convenience items like prewashed salad greens or pre-cut vegetables can really save you prep time. Whole cooked chickens or ready-seasoned meats from the supermarket are also great time-savers. Prep once, cook twice(or more). If a recipe calls for half of a chopped onion or bell pepper, don’t stop there – keep chopping, and stash the rest for another day. As long as you’re browning ground turkey for spaghetti sauce, why not brown extra to use in tacos or stuffed peppers tomorrow? Make extra brown rice or quinoa and freeze for another meal. The grains stay moist and reheat well in the microwave. One dish meals generally combine your protein, your vegetable and your starch all in one dish – they’re healthy, they’re balanced… and you’ll have a lot fewer pots and pans to wash.If you’re organised enough to plan your meals for a few days, it does make life a lot easier. Once you’ve chosen your recipes, you can make your shopping list for the week. When you’ve got your menus down and your ingredients on hand, the meal-planning battle is practically won.